LEXINGTON, Ky. (April 15, 2019) — The University of Kentucky has a great entrepreneurial and innovative community, and two events celebrated this spirit on March 26. The Office of Technology Commercialization (OTC) in partnership with the UK Alumni Association and UK Philanthropy hosted the inaugural UK Entrepreneur Showcase. The UK Entrepreneur Showcase provided an opportunity for alumni entrepreneurs, student researchers and UK startups to discuss their experiences and make connections. The program began with a keynote address from Lee Todd Jr., former UK president, who discussed his work as UK's president and an entrepreneur. UK President Eli Capilouto spoke about the legacy Todd created and presented him with the first Office of Technology Commercialization’s Lee T. Todd Lifetime Achievement Award for Entrepreneurship. Two UK alumni, Shawn Bay and Jonathan Webb, spoke about their entrepreneurial experience; five student researchers, Shelby Browning, Asare Nkansah, Christoph Kositzke, Joshua Preston and Kenyatta Mitchell, presented on the research they have been working on; and three members of the UK startup community, Kendra Steele (Lepidext), Seth DeBolt (Red Leaf Biologics) and Joseph Chappell (Enepret), presented on the companies that were started out of UK innovations. After the event, everyone had the opportunity to meet the speakers and make connections. Following the showcase, OTC hosted their third annual "Patent Palooza!" to celebrate innovations that occurred during the fiscal year 2018-19. During the event over 50 innovators were recognized for 23 patents issued, 29 licenses and options executed, six Small Business Innovation Research and Small Business Technology Transfer (SBIR/STTR) awards received and one UKAccel graduation. Lisa Cassis, UK's vice president for research, gave remarks and introduced Capilouto, who welcomed everyone to the event. Fang Zheng was recognized for her 10th patent with a milestone patent award, and Rodney Andrews, director of UK's Center for Applied Energy Research, was given honorary member status in the National Academy of Inventors (NAI). The awardees and attendees also had an opportunity to network and connect with one another. “Our annual 'Patent Palooza!' and now our UK Entrepreneur Showcase are events that allow us to raise up the great innovation happening as a result of our campus’ amazing intellectual capital," said Ian McClure, director of the OTC. "UK OTC is proud of all of our innovators, and thank them for their work in FY18 that, combined with the efforts of UK OTC, resulted in a best-ever year for inventions, patents and licenses." To learn more about the presenters, visit UK Entrepreneur Showcase. 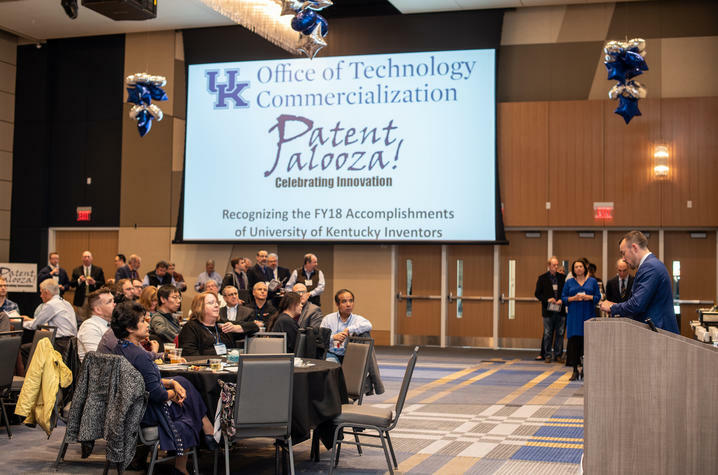 To see the awardees from the fiscal year 2018-19, visit "Patent Palooza!"